Apparently, I’m kind of hungry for some cookie dough this week. Not really sure what that’s about, but you get to reap the benefit, my lovelies. 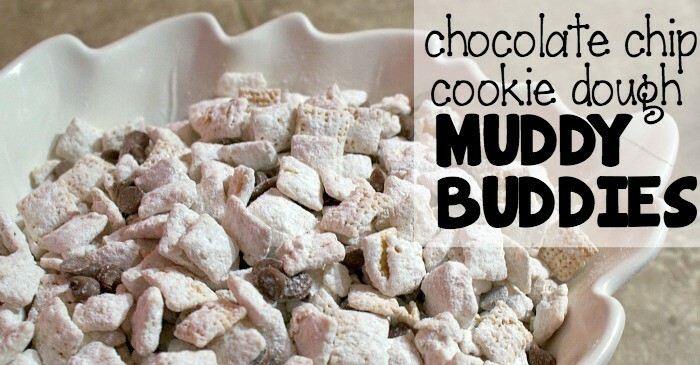 Allow me to introduce to you the snack of the day: Chocolate Chip Cookie Dough Muddy Buddies. Yes, my friends, it’s yummy, dairy-free, egg-free, nut-free, gluten-free and absolutely NOT sugar-free. You may commence mashing your face into it in less than 10 minutes. You’re welcome. Sorry if I’m a little over-enthusiastic about my snacks this week. You see, I’m building up to a big Kawaii Cookie Party on Friday. There will be cookie treats out the wazoo and so much pink-and-teal, you’ll be scrubbing it out of your clothes for weeks. Yes, my friends, I love my cookies. So much so that I’m planning a party and needed to try out some snacks ahead of time. Be sure to head back over on Friday. I promise, you will not be disappointed. 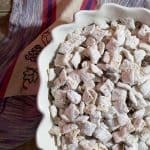 Now, about THIS snack, the Chocolate Chip Cookie Dough Muddy Buddies. 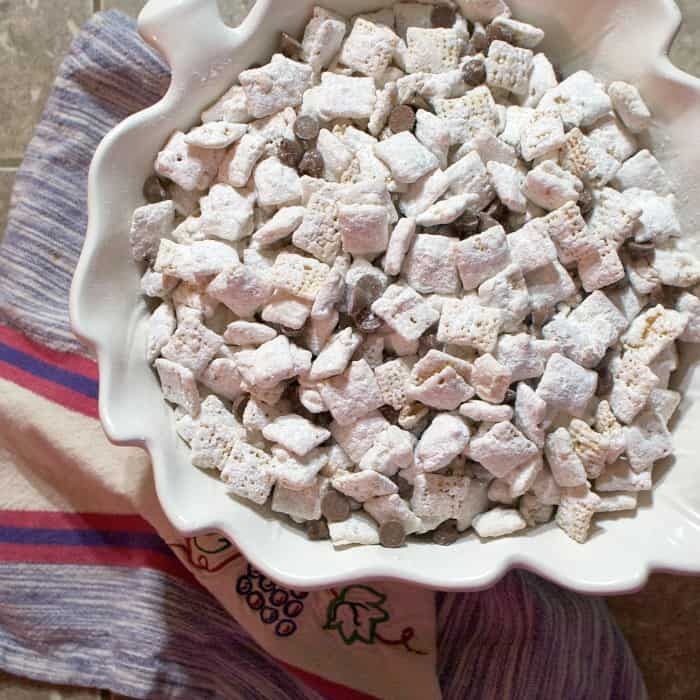 You may call them Puppy Chow or whatever you want, but I call them “deliciousness that needs to be in my tummy as of right now”. Well, Muddy Buddies is kind of the shorter version, so I’m going with that. In all seriousness, though–HEH I CAN’T BE SERIOUS! This was a very yummy snack that somehow disappeared off the counter in less than 9.2 seconds. For reals, the teen walked past and VOOM, the Cookie Dough Muddy Buddies were gone. And when I asked him to share…there were growls, like real puppy-dog growls. My bad, kiddo. I should have never suggested that I get to eat any of my own creations…never. So, to you, my lovlies, I submit this recipe for your perusal. Take a gander and let me know what you think. Hit me up with a tweet! I’d love to hear back from you. Place the white chocolate chips into the microwave for 30 seconds. Stir and repeat until melted smooth. Add vanilla extract, salt, and brown sugar to the melted white chocolate. If the white chocolate mixture is no longer smooth, place in the microwave again for 10 seconds and stir. Pour over the cereal and stir until mixture coats each piece of Chex. Dump into a gallon-size baggie. 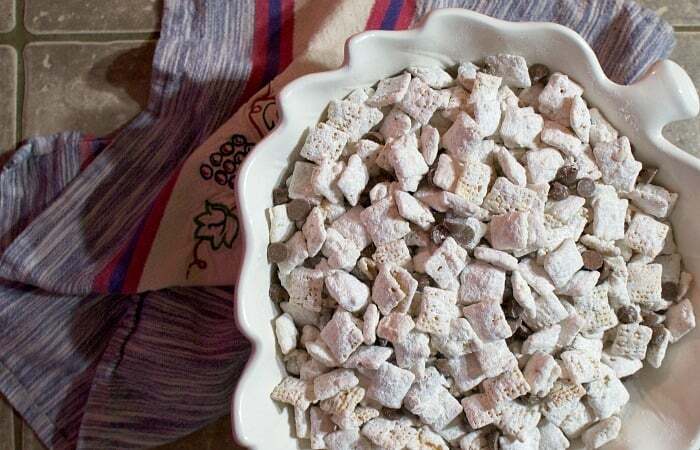 Pour powdered sugar over the contents of the gallon-size baggie, then seal and shake until all of the cereal pieces are coated. Add regular chocolate chips to contents of baggie and shake gently until chocolate is dispersed throughout. Pour into a serving bowl, or just attach baggie to your face and begin grazing. Your choice. Heh.